I really like the design of this Westone Corsair Classic, it looks almost as if a Fender Stratocaster has been given the Gibson Junior treatment. Or perhaps a slightly offset version of Fender's Lead series guitars. Of course this is one of the Sid Poole designed Prestige-series Westones built in the UK by the makers of the Status Graphite bass. It's virtually identical to the Westone Cutlass which differs only in pickup configuration. This guitar is currently listed on eBay UK with a wholly reasonable Buy It Now price of £400. 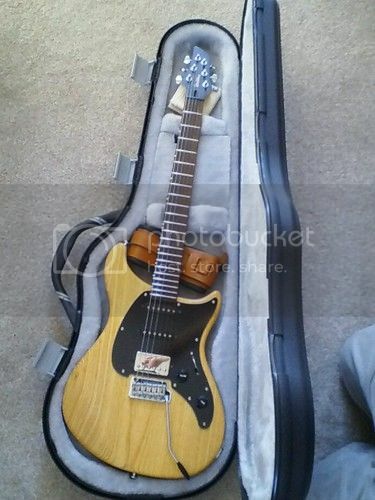 Alas, the seller specifies collection in person, which is quite a bummer if the prospective buyer is not within easy travelling distance of Swindon in Wiltshire, and is also peculiar given that the guitar comes in a hard case which looks like it'd easily provide adequate protection against the rigours of being sent by courier. Cool guitar - reminds me a little of the PRS EG series as well, although the pickup set up on this is better. Sid Poole lived close to me and I bumped into him a few times over the years - lovely guy who really was incredibly humble. You'd say "How's business?" and he'd say "Well not too bad..." then list a who's who of rock that he was working for at the time. Sad loss when he died so young. I played a Corsair when they were being dumped on the market for about £300 retail after not selling and, I have to say, while the guitar was beautifully built the sound was a massive disappointment. I believe the pickups were Gotohs and they were very bland and characterless.